Also known as the Bronze-Winged Pionus, Pionus chalcopterus, this delightful little bird has been somewhat ignored by US parrot keepers until recently. However, it has many fine pet qualities and boasts a beautiful “color scheme” that is not common among its relatives. The 11-inch-long Bronze-Wing’s beauty lies not in bright, “screaming” plumage but rather in a subtle blend of colors. 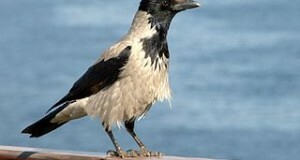 It may at first appear somewhat dull, but closer inspection will reveal that the body plumage is dark purple to navy blue, and overlain with a bronze tint…quite attractive and ever-changing with light levels. The pink eye ring and pink-edged head feathers add to its unique appearance, and red coverlets decorate the tail. The Bronze-Winged Parrot’s range lies in a narrow band that extends from northwestern Venezuela (where I once unsuccessfully searched for it) through Columbia and Ecuador to northwestern Peru. It is mainly found in wet, mountainous forests, and has been observed at over 9,000 feet above sea level (please see photo). Lowland forests and cleared areas are sometimes utilized as well. Not much is known about the Bronze-Wing’s life in the wild, as it usually forages high in the forest canopy and is therefore difficult to study. Fruit, especially various figs, is believed to comprise the bulk of the diet. Outside of the breeding season, it forms small groups and large flocks. Bronze-Wings are usually described as “gentle but easily excited”. My own experience is in line with this, and I recommend them for owners with a gentle touch and calm household. Despite their reputation as “sensitive” parrots, Bronze-Wings have great pet potential, and may reach age 30-40. In the right situation, they remain quite calm and are easily tamed. Once accustomed to their owners, Bronze-Wings enjoy close contact and many become quite playful. Some owners report that males have a tendency to bond closely with one person, and to be aggressive to others. 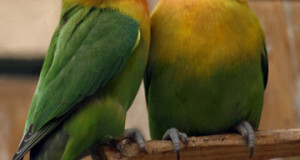 They are rather quiet as parrots go, although their high-pitched voices are sometimes hard to take. Although not known for extensive vocabularies, many will learn a few words. Like other Pionus parrots, Bronze-Wings will wheeze when stressed, often leading owners to suspect a respiratory infection. Although not very large, Bronze-Winged Parrots are quite active and seem especially prone to stress-related disorders when kept in small enclosures. Large cages or aviaries are ideal, and daily out-of-the cage time is essential. 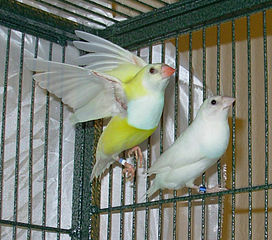 Pairs that are closely confined may over-preen one another to the point of severe feather loss. Some owners report that Bronze-Wings chew and bathe more than most parrots; I have not noticed a significant difference between them and other Pionus parrots in these regards. Fruit and greens figure highly in the natural diet of Bronze-Winged Parrots. Perhaps because they are often fed an over-abundance of seeds and nuts, pets have a tendency to become obese. Provide your Bronze-Wings with a wide variety of fruits and vegetables on a daily basis, and be sure to search out “exotic” varieties if these are not available from your usual store. Pomegranate, prickly pear fruit, apples, kiwi, carrots, peas, corn, dandelion, kale and many other types of produce will be readily accepted (introduce new foods slowly to avoid digestive upset). 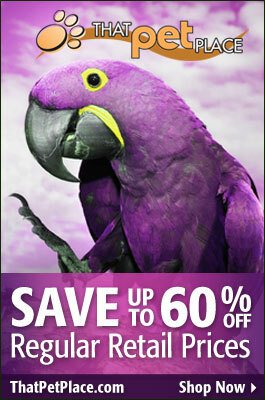 The balance of the diet should be comprised of a good small parrot seed mix. Avoid diets formulated for larger species, and be sure to sprout a variety of seeds for them as well (please see article below). Breeding is best attempted in large aviaries. Bronze-Wing clutches average 2-4 eggs, which are incubated for 24-27 days. Only the female incubates, but the male often sits beside her in the nest hollow – the mothers among my readers must, I’m sure, wonder just how “useful” this is!